Break through winter’s dark and cold with the warmth of an Acucraft fireplace. A wood burning fireplace is perfect for staying warm on wind-howling winter evenings, lounging around on Sunday afternoons, or creating conversation around at your next gathering. Among the wood fireplace models to choose from are see through fireplaces, single sided fireplaces, or indoor/outdoor fireplaces. Any of these wood fireplaces will make your living space cozier for you, your family and friends to enjoy during the holidays and winter months ahead. Acucraft Hearthroom 44 See Through Wood Fireplace showing both sides. A see through fireplace allows a unique style on either side to accommodate each room decor—like a dining room and a great room. The Acucraft See Through Fireplace is ideal for placement between two evenly sized rooms or in the center of a large room for equal heating throughout the space. Acucraft See Through Indoor/Outdoor Wood Fireplace (inside). Acucraft See Through Indoor/Outdoor Wood Fireplace (outdoor). For a unique see-through fireplace that connects your indoor space with your outdoor space, Acucraft offers their patent-pending indoor/outdoor fireplaces—it’s like an indoor fireplace and an outdoor fire pit in one! With the indoor/outdoor wood fireplace, wood that is stored outdoors can be loaded from outside and the fire warmth and ambiance can be enjoyed from the inside. This way there is no need to haul wood indoors—keeping it cleaner inside. The Acucraft See Through Fireplace is a great choice between rooms of equal size or within the center of a large space. However, there are instances when an Acucraft Indoor/Outdoor Wood Fireplace is the best choice between two interior rooms of unequal size—like a bedroom and a great room. 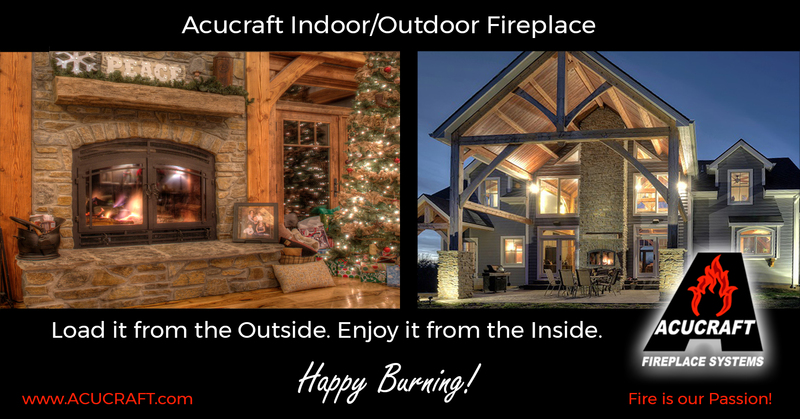 If you’d like more heat in the great room and less heat in the bedroom, then an Acucraft Indoor/Outdoor Fireplace is a great option. Whether you choose an Acucraft See Through Fireplace or Indoor/Outdoor Fireplace, either makes a stunning focal point to your home and provides cozy warmth for the cold days ahead. If you’re looking for a rustic wood burning fireplace or a sleek modern gas fireplace, Acucraft Fireplace Advisors and Designers will help you create a fireplace that will work within your home decor and lifestyle. Call Acucraft Toll Free (888) 317-6499 or learn more at: Acucraft See Through Gas Fireplaces or Acucraft See Through Wood-Burning Fireplaces. Acucraft has been designing, engineering, and building world-class fireplaces for over 39 years. By using seven-gauge steel and high-quality components, your Acucraft Fireplace is built to last a lifetime of happy burning.